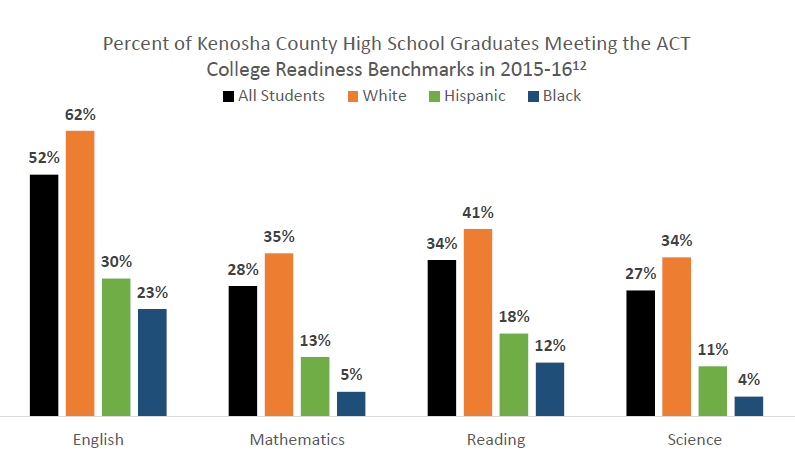 Ensuring students are ready for post-secondary education or the workforce after they graduate high school is paramount to the success of both students and Kenosha County. ​Creating a partnership of school districts, businesses both big and small, and post-secondary institutions provides a partnership that can identify which skills are needed and how best to address any skill gaps that may exist. ​"High performing schools are a key building block for a healthy and prosperous community. This initiative focuses on improving educational outcomes by supporting our schools while also working to address larger community issues that impede student success. The KABA Foundation is a proud partner and supporter." According to the US Census, those without a high school diploma in Kenosha County are 1.3 times less likely to be employed and earn about $19,000 less every year than those with only a high school diploma. Igniting the drive within a student starts early - making them aware of outcomes past high school makes them more likely to complete their diploma and pursue opportunities after graduation. The college readiness partnership will be vital in completing this task. ​Thank you to the following organizations for their involvement with this action network!